Charles MacArthur was the son of a Baptist minister. He worked as a reporter an accompanied General John J. Pershing to Mexico where the latter chased Pancho Villa. During the First World War he served in the army and he published his experiences in "A Bug's Eye View of the War". After the war he worked as journalist in Chicago. When his short stories started having succes he moved to New York. There he wrote several Broadway plays, among them "Lulu Belle" and the very succesful "The Front Page". In 1928 the actress Helen Hayes became his second wife. They lived in Nyack near New York City and had a daughter, Mary. Together with his collaborator Ben Hecht he went to Hollywood where they wrote screenplays for many movies. During the Second World War he served in the Chemical Warfare Service. In 1949 Mary died of polio aged 19. MacArthur continued to work but he never really got over her death and he died himself in 1956 in New York City. His adopted son James MacArthur was also an actor. 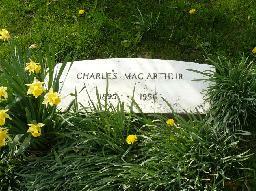 The grave of Charles MacArthur at Oak Hill Cemetery, Nyack. 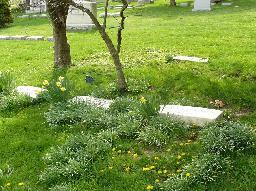 The graves of Helen Hayes and Charles Mac Arthur at Oak Hill Cemetery, Nyack.